Maker’s Notes: Pale gold, effervescent, with a pronounced fruit aroma hinting of peach and melon. Don’t let the heady nose fool you – with no residual sugars, the flavor is crisp, tart, and exceptionally dry. Uniquely refreshing with a complex finish. Pork, duck, sharp cheeses, and wild game are all complemented by its bright yet balanced flavor. My Review: I somehow went the first five years of writing this site with almost no coverage of cider, and here I am, writing about two different Virginia ciders within a few months of each other. My how the times have changed. With our recent experience to Blue Bee Cider, just down the road from my home, both my wife and I have been branching out and trying more ciders. While she was at the store before New Years Eve picking up some things for a party we were attending, my wife grabbed a bottle of the Potter’s Craft Cider Farmhouse Dry for us to have at home. I’ve had Potter’s Craft once before, during a visit to Mountfair Vineyards, but it was little more than a tasting, and I wasn’t able to enjoy an entire bottle (ok half a bottle since I shared with my wife), like I was this bottle, which we opened while making dinner before heading out for our New Year festivities. In the glass the cider was a pale gold, and on the nose I picked up apple (obviously) mixed with peaches. In the mouth the cider was dry and crisp, refreshing and with plenty of effervescence, though not so much as to be unpleasant. Our pairing was, admittedly, not the best – a spicy pasta and fish dish that came with our Blue Apron, but both before and after the meal it was pleasant to sip on, and I’d love to try this with some grilled pork once the weather turns. We’re making some great cider here in Virginia, and it’s increasingly becoming available at local restaurants and stores. I find myself enjoying the variety and even seeing it as a nice alternative to some white wines for when I want something crisp, dry, and local. I’ve yet to make a trip to Potter’s Craft Cider yet, but my hope is that after the weather warms up to make a trip out to “wine country” and focus more on cider. 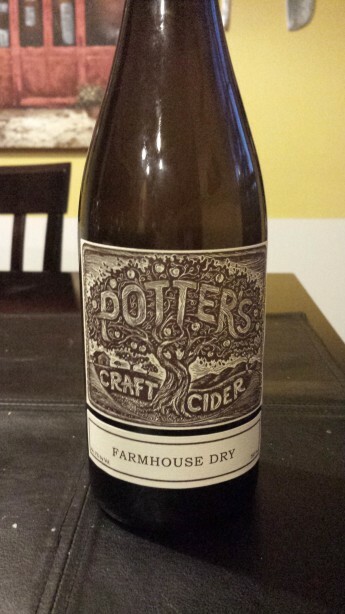 Potter’s Craft Cider will definitely be on the list to visit, as I very much enjoyed their Farmhouse Dry and would love to see what else they’re making.